Tungsten carbide composites can be used as dies and anvils in electrical upsetting. Tungsten Copper Carbide is a refractory Tungsten-based composite obtained by the process of pressing, sintering and infiltrating. 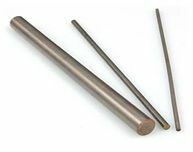 The Tungsten content ranges from 50% to 70% by weight. This strong material has good mechanical properties and is highly resistant to arc erosion in contact welding. It is mainly used in oil devices to protect the contact from oxidation. CuWC50 and CuWC56 grades have excellent resistance to mechanical wear and are mainly used for electrical contacts. CuWC50, with higher copper content and electrical conductivity, is used in heavy duty contactors and transfer switches. CuWC56, higher in strength, is used where high impact forces may be encountered and greater wear resistance is desired, such as tap changers and arcing contacts in oil breakers. Due to its high hardness and strength,CuWC70 is used in more severe electrical upsetting and electro forging applications.